Mdb password recovery Tool is an outstanding and innovative to quickly retrieve the lost or forgotten MS Access Database(.mdb/.accdb) passwords. It supports all the editions of Windows Operating System with support for both 32 and 64-bit. Exact ACCDB and MDB password recovery to open the Access document. Retrieve complex Access database passwords. Open the MS Access document file after the password has been recovered. MS Access is required to be installed on the system to recover or remove the password from MDB file. Supports all the versions of MS Access 2013 and below editions. Using this MS Access Password Recovery then the user can unlock any type of password created by them. The MDB Password Recovery utility can retrieve all the multilingual passwords, passwords which contain numbers and special characters passwords. The user can also restore the password in its original format. The MDB Password Recovery makes any kind of protected passwords accessible. Users can open the password protected MDB file using Access Password Unlocker. It helps in recovering or unlocking the lost or forgotten MDB or ACCDB database passwords. The user interface in this mdb or accdb password recovery utility is based on a single panel where all options and commands are featured in the single panel. The software makes it easy to use for the users with the less technical for the novice. Once the MDB file is added the software does the quick scanning of the file. The details include the information of the Access database created in Access 95 and 97 and then it restores the Access Database password of MDB or ACCDB database files. 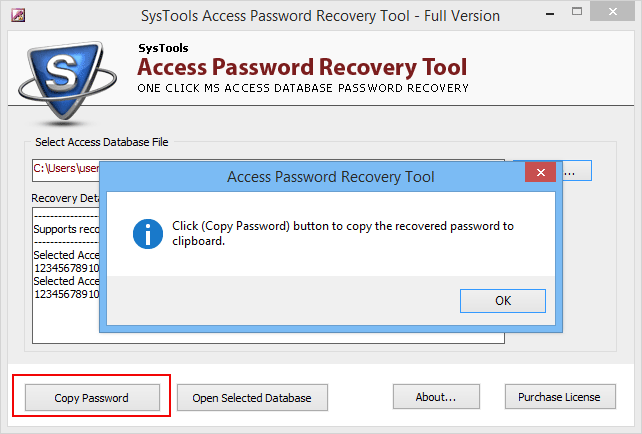 After the database recovery users can copy the database password using Copy button and then open that database file. Q.1. 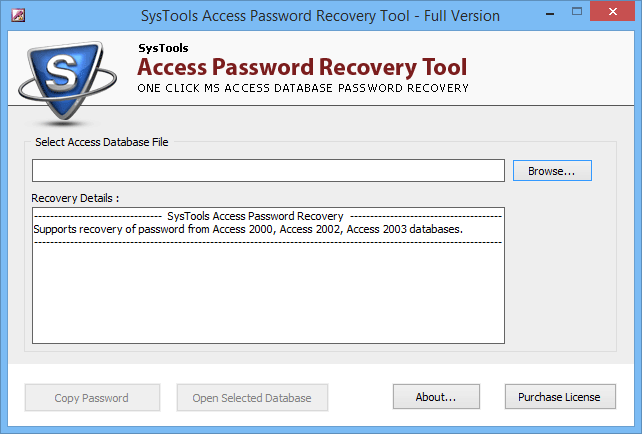 Can this access password remover software reset the password of my database file? No, the software cannot reset the password of any database file. It is the access database password unlocker which recovers the lost passwords of the database file like .mdb and .accdb. After the password has been recovered at that time you can reset the password. Do I need to Install the MS Access application to remove the password from the database file? Yes, the Access Password Restore software requires the installation of MS Access database. If the Access Password utility is installed then the utility can easily remove the password from .mdb and .accdb files. Can I recover my corrupted .mdb database file using this software? No, the MDB password recovery Tool only recovers the lost or forgotten password of the MS Access database files. Step 1 : Download, Install and run the Access Database Password Restore Tool on the system. Step 2 : Click on the Browse button to select the password protected MS Access MDB file from its location. 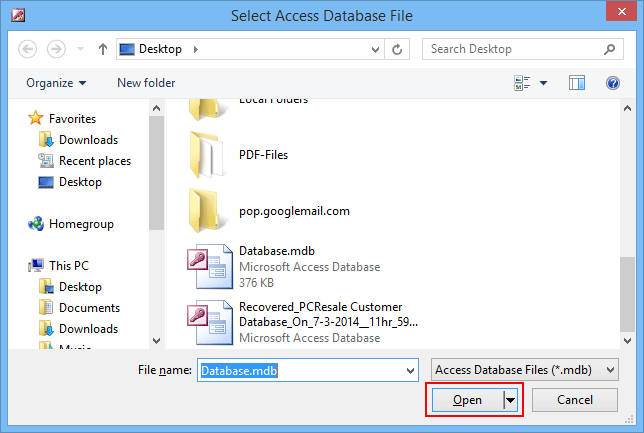 Step 3 : Select the MS Access MDB file from the location it has been saved and then clicks on the Open button. Step 4 : After the Open button has been clicked, a dialogue box will appear on the screen. Now click on the Copy Password option to copy the password of the selected MS Access MDB database file. Step 5 : After the Copy Password option has been clicked, a dialogue box will appear giving the following message “Password Copied to Clipboard”. Step 7 : Now paste the password in the password dialogue box in MS Access by pressing CTRL+V together and then click on OK button. Step 8 : Now the password protected MS Access database file will get opened and show all the records and tables contained in it. The engineering team of this product has done a great job by creating this tool for all kinds of users. I am very glad by using this MDB password recovery software as many of my database admin forgets the password they create for their databases. But they sometimes forget the password they had created. Thanks to this software it is very much capable of recovering nay kind of passwords. I rate this mdb & accdb password recovery software 10 out of 10.